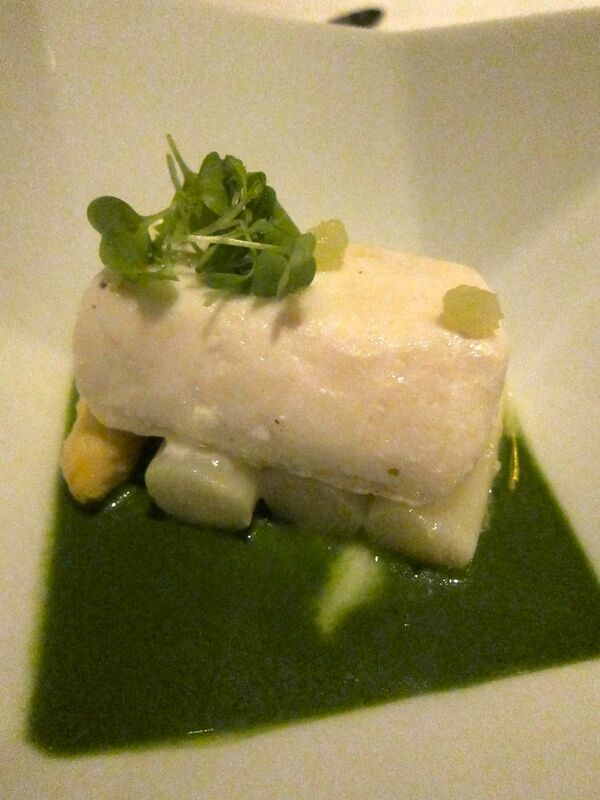 Jean-Georges’ halibut in herbal lemongrass sauce disguised as a monument. By daylight, even with its constant muted flow of pilgrims, the back room at Jean Georges is a cloister for worshiping the senses. It’s been my neighborhood lunch spot since I first discovered its surreal magnetism – the cosmetic light, the cocoon of isolation from urban assault, the promise of sensory astonishment. It’s just an amuse after all but multiple swoons on a plate. As the tariff inevitably crept from $28 for two courses (each extra dish $12) to $38 (with $19 for each additional) and the largesse of farewell sweets tightened – from six macaroons to two, 16 chocolate bonbons to 6 -- it remained my sanctuary, oops, my canteen. Still a bargain, after all, scarcely bruising compared to the price of dinner here, $108 now for three courses prix fixe with dessert, $168 for the menu of signature dishes. Putty cool banquettes and an octopus of lighting overhead, setting for drama. I waited for the Daddy Warbucks or the Lady Bountiful who would invite me for dinner. Now a media prince entered my life, a regular here. I arrive first. As daylight buries itself somewhere in New Jersey, the room grows shadowy. That magic incandescence – as cosmetic in a burst of rain or clouds as on a sunny day – disappears. The carpet is brown. The banquettes, invisible in putty. I find myself annoyed again by the octopus of light coiling above. Sipping a passion fruit whiskey sour with a hint of chili might help. Now the media pasha is here. Champagne is poured. My host and the sommelier have collaborated before. He trusts her advice. The captain is friendly, but not too. Servers do their minuet. Finally the room disappears. The amuse is here. A trio as always. Small and not so small. Always something to sip. Needless to say, seasonal. But never predictable. A small “sandwich” layering mozzarella with a tristar strawberry in balsamic with a thyme sprig and tellicherry peppercorn oil. The tongue prepared for tomato tingles with the fruity sweetness of strawberry. Fluke sashimi and melon are painted with miso. The Serrano pepper fills your mouth. In the glass: wild watercress sorbet, crème fraîche and green almond. 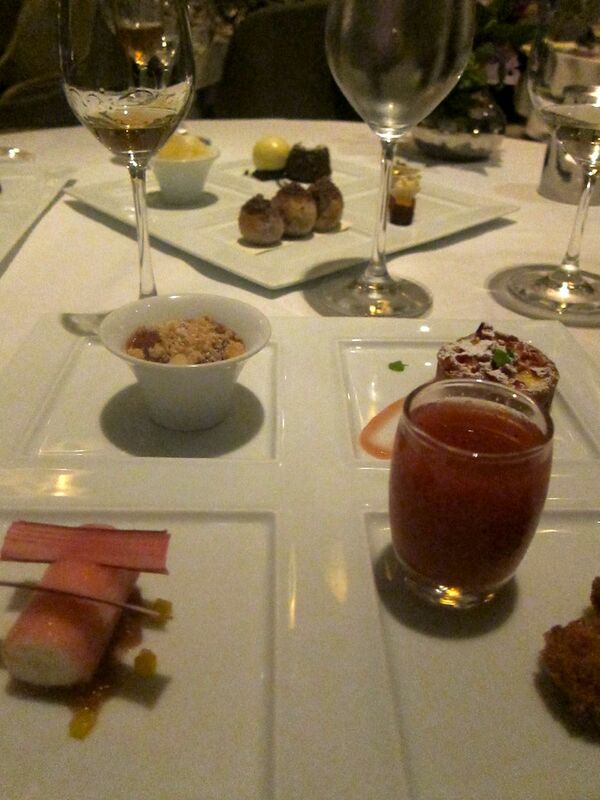 It’s just the amuse for goodness sake. And already your taste buds are staggering. Bread. Several kinds, of course Do we really need bread? Definitely. Just in case. In case of what? Hmm. I don’t know. I must have the bretzel, and the chewy Norwegian multi grain, perhaps a mini baguette and a rectangle of Sullivan Street sourdough. Thank heaven they sent out four sea urchin. I only have to give away two. Caviar with a plop of crème fraîche on a Meyer lemon mousse in a lemon shell. I see my favorite sea trout dish has changed. The last two times I ordered it, an electric shock of unimaginably intense lemon raced to my brain and curled my toes. The sweet and sour jus of the black sea bass evoked a sharp cry that turned heads. When I manage not to order squab in one of its seasonally evolving couturier accessories, I almost always have the sweetbreads. I vow to resist them now. It says caviar, $25 extra. He’ll have it. A variation on Jean-Georges’s usual caviar in an egg, it’s a generous oval of caviar on Meyer lemon gelée inside a scooped out lemon shell, with a pouf of crème fraîche. 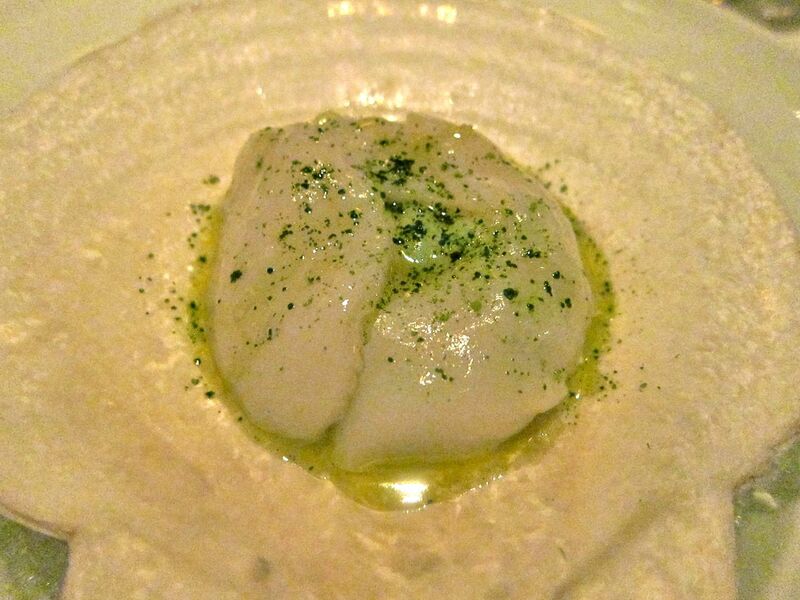 The olive-oil slicked voluptuousness of scallop carpaccio gives me shivers. Caviar doesn’t tempt me when uni is on the menu. My old favorite, Santa Barbara sea urchin on black bread painted with yuzu and tattooed with jalapeño, missing from recent menus, is back. These four are a bit smallish – at lunch they will be just two – but my mouth fills with ocean brine. I close my eyes for that second wave. 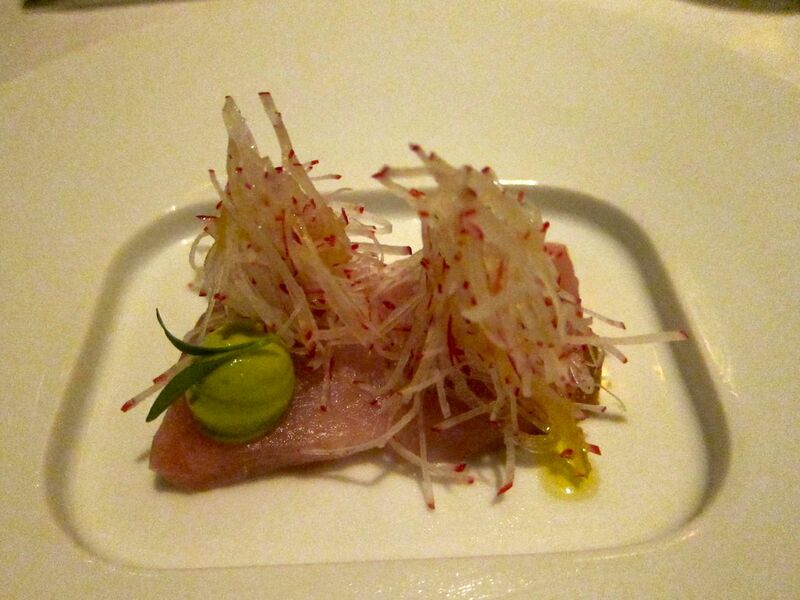 Hamachi sashimi with avacado, yuzu and a thatch of shaved radish. Then as almost always happens here, the kitchen sends out an unexpected in-between. Just looking at the voluptuous scallop carpaccio, slicked with olive oil and sprinkled with matcha tea powder, hiding sugar snap pea remoulade -- I anticipate that texture. There it is…sweet and fleshy in my mouth. I shake my head and gasp. My companion sips his wine and waits patiently to trade. We scarcely know each other but he knows. I taste his raw hamachi under its thatch of radish. Good enough. But even with its citric blast of yuzu and a buttery globe of avocado, it cannot quite compare. 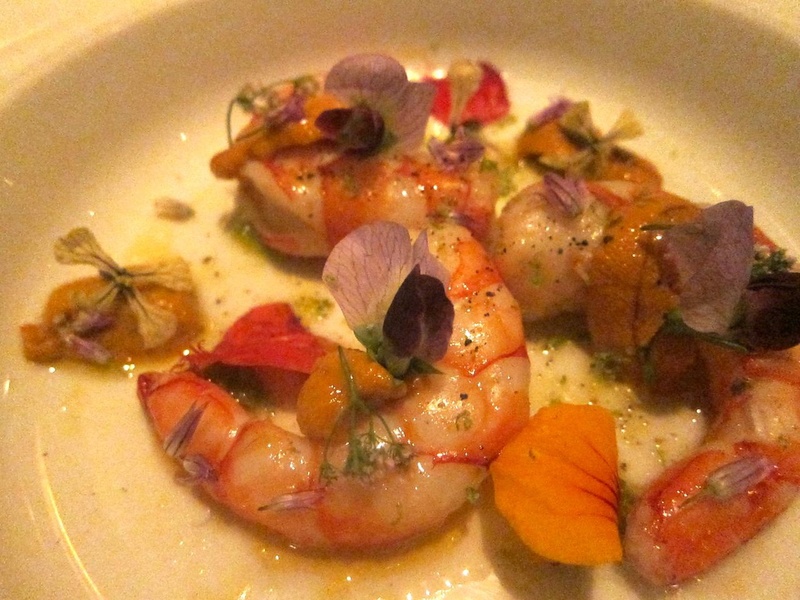 Maine ruby shrimp and sea urchin with green chili and lime in a garden of pansies. I rarely order shrimp. Shrimp are unreliable. But these are Ruby Reds from Maine with sea urchin. I’ve said dibs first. 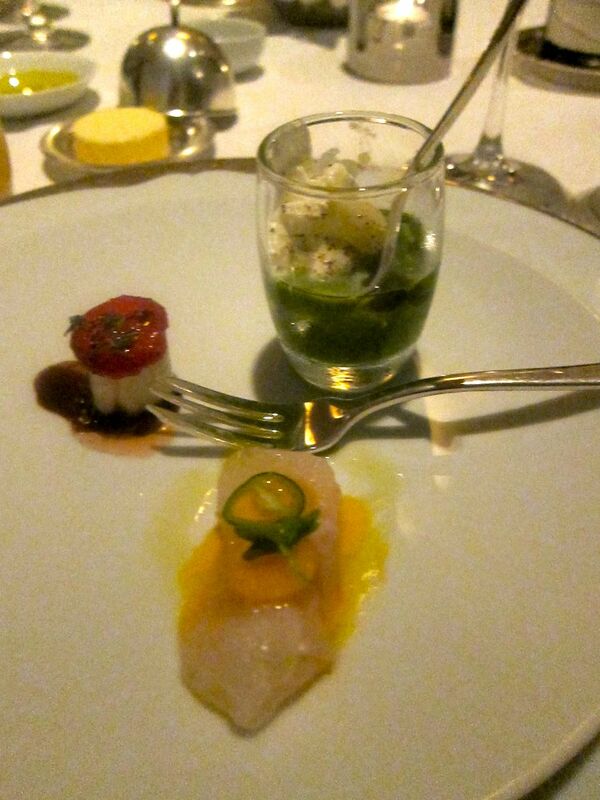 His halibut, carved to look like a marble paperweight on white asparagus logs in a puddle of kaffir lime green, is handsome indeed, but fifth runner-up to Miss Maine -- blushing pink curls of shrimp with purple petal of pansy and crimson nasturtium. I bite into a shrimp. It reminds me of the first time I had a sea creature at Fredy Girardet-- the astonishing texture, so delicate, never before tasted, perfumed with sea urchin too and now wired with an after-kick of green chili. Maine lobster sautéed with ramp butter, fava beans and potato gnocchi. At that point, the lobster is almost redundant. Sheer excess. But I make a valiant dive. After all, it’s exquisitely cooked too in a smart toss of gnocchi with favas and ramp butter. I don’t even remember ordering lamb – with bare ribs pointed, the duo of chops look like a beetle – two or three glasses of wine and a few out-of-body oh-my-god moments can do that. At first I’m not sure I like the sweetness of the glaze, but the smoked chili after burn, converts me. And the crimson flesh is just as I ordered. 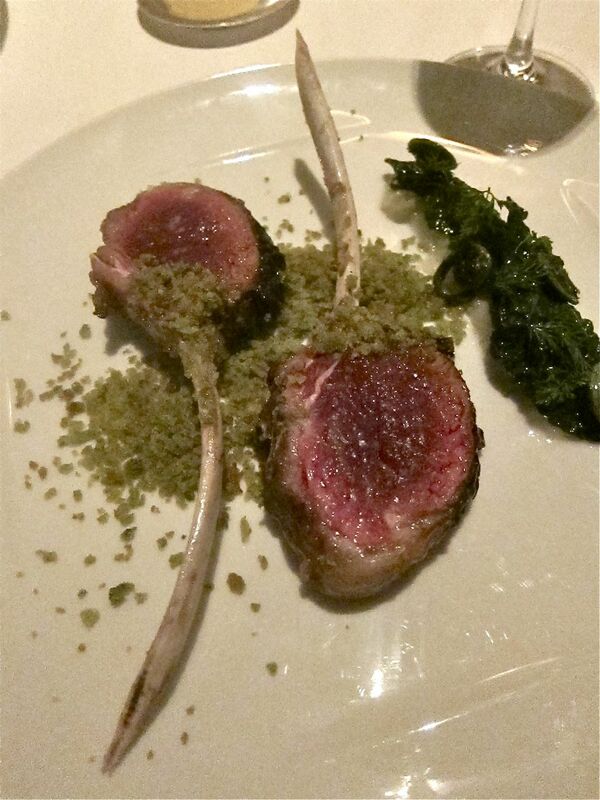 Rack of lamb with smoked chili glaze on spring onion compote with fiddlehead ferns. 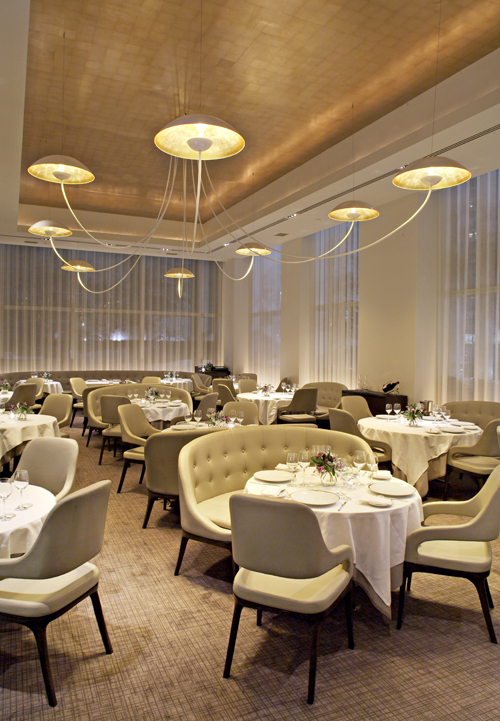 Joseph Murphy has taken over the pastry room from the charismatic Johnny Iuzzini. He’s committed to producing the house’s themed dessert tastings: duos at lunch, in variations of four harmonizing sweets at dinner. Rhubarb is first choice for both of us. No problem. He’s the host after all. I’m tipsy but still cool enough to order Chocolate. New patissier Joseph Murphy celebrates rhubarb four ways. Meyer lemon ice, chocolate covered ice cream, the chef’s signature melting chocolate cake. Orange flower yogurt, rhubarb almond crumble, rhubarb creamsicle. Yes, yes, yes. But I would have been happiest with just Jean-George’s grandmother’s Alsatian rhubarb tart. Of course there will be nougats, macarons, house-made marshmallows and chocolates. Now just as I’m wishing the EMS disguised as samurais or the French Foreign Legion would wheel me out to an ambulance or even a town car, there come candies, fruit gels and chocolate bonbons. The sommelier has delighted my host with a chilled dessert wine. I must taste, Brillat Savarin save me. A waiter offers house-made marshmallows. He will cut a few with his scissors. No. Not the marshmallows. I’m on a diet. Have sympathy please. 1 Central Park West. 212 299 3900. Lunch Monday through Sunday 11:45 am to 2:30 pm. Dinner Monday through Thursday 5:30 to 11 pm. Friday through Sunday 5:15 to 11 pm. Photographs may not be used without permission from Gael Greene. Copyright 2012. All rights reserved.